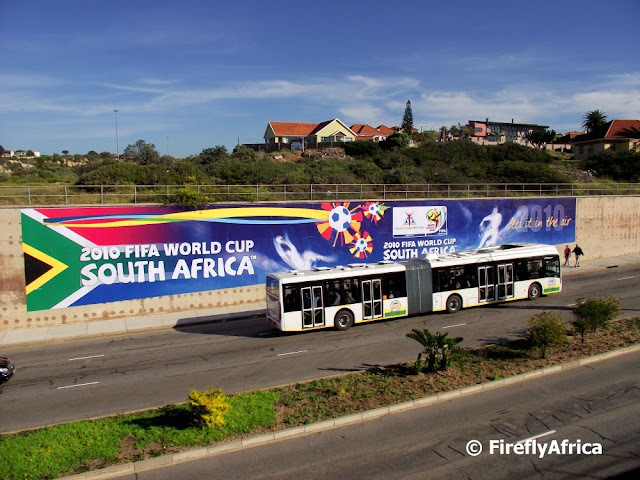 To avoid too much traffic congestion around the stadium (as well as the fact that there isn't too much parking available), the city has implemented a Park & Ride system during the 2010 FIFA World Cup. 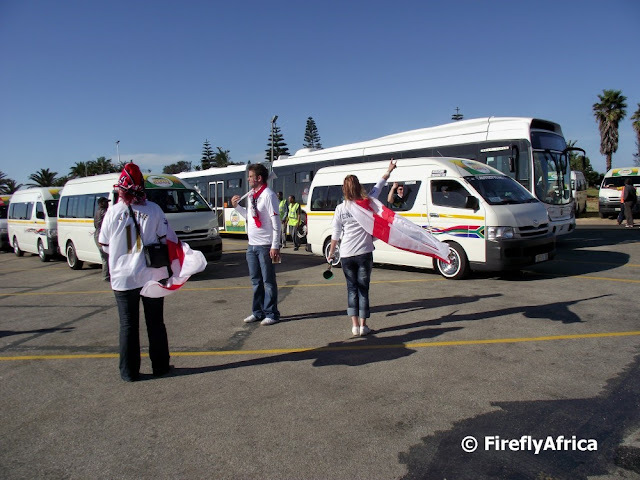 There are three designated and secure Park & Ride areas around Port Elizabeth where soccer fans can leave their vehicles and take the shuttles to the stadium. This is the Park & Ride on the beachfront that are used mostly by those fans staying in the hotels and guesthouses in that area. Most of the minibuses are taxis that has been subcontracted during the event while the buses are part of Port Elizabeth's new Bus Rapid Transport (BRT) system. The Kings Beach parking area is one of the transport pickup points for the 2010 FIFA World Cup. The majority of soccer fans staying on the beachfront would thus make use of this to get to the stadium for matches. Obviously the soccer memorabilia traders figured that out before the event and have set up shop along the walkway where the Kings Beach Flea Market would normally trade from on the weekends. 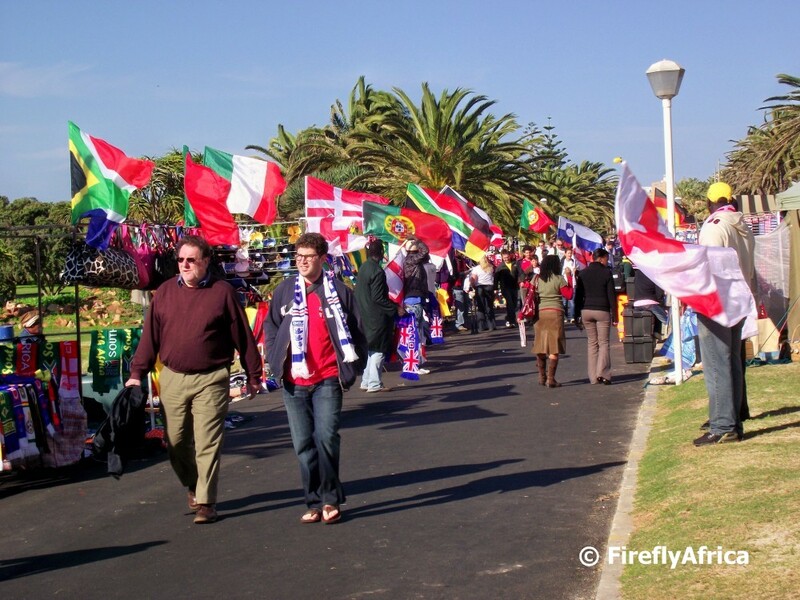 The walkway is a myriad of colours and flags from all the competing countries. With the England vs Slovenia game in Port Elizabeth last week I noticed that there were quite a few people on the beachfront offering face painting services to fans. 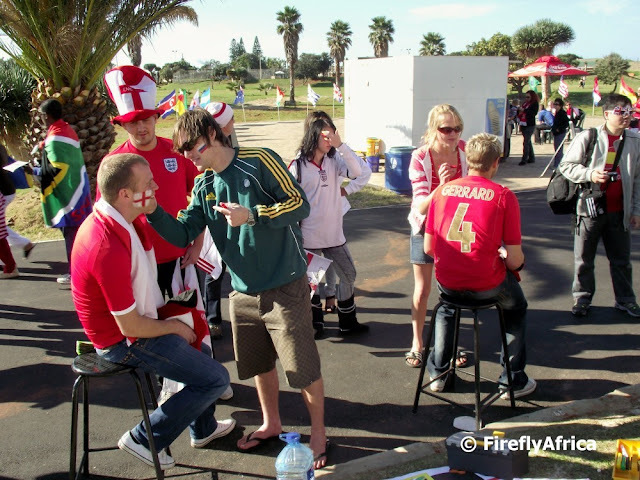 Specially the English fans were queuing up to get the England flag either painted on their cheeks or have their whole face coloured in. I imagine that this kind of face painting would be termed war paint. England played against Slovenia at the Nelson Mandela Bay Stadium last Thursday and they estimated that 20 000 England supporters descended on the city. 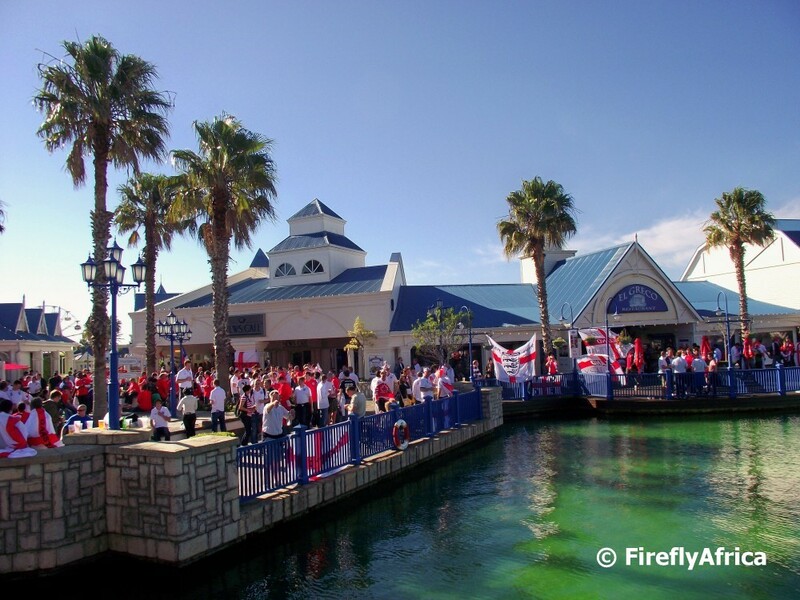 Before the game the England fans flocked to the beachfront for a couple of beers before heading to the stadium. I popped down to the Boardwalk to see how many of them were around there and found that the place was teaming with red and white clad beer drinking English fans. The pubs must have made a fortune. Part of the 2010 FIFA World Cup branding on the corner of Marine Drive and Walmer Boulevard with the Port Elizabeth Harbour in the background. I'm not sure if its supposed to be that way, but the sign points towards the stadium. The city has trained 750 Host City Volunteers who has offered their time and services in areas where their support are needed. About half of them are roaming the streets around Central and on the beachfront as well as the FIFA Fan Fest at St Georges Park (and airport, some shopping centres, etc, etc) to disseminate Host City Guides and help visitors with directions, times and transport information. The other half has been deployed at the transport points to and from the stadium and Fan Fest. 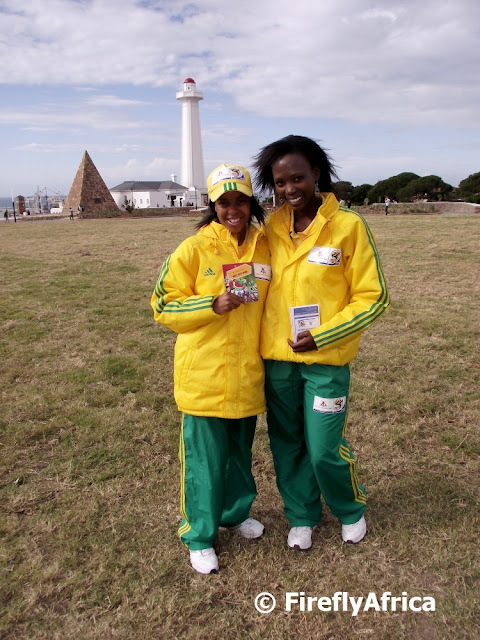 These volunteers are easily recognisable in their yellow and green Host City outfits. I encountered these to young ladies on the Donkin Reserve when I popped down there the other day. Port Elizabeth (through the Nelson Mandela Bay Municipality) has been using the "Feel it in the Air" campaign in the run up to the 2010 FIFA World Cup. The campaign involved "cloud men" playing soccer. I took this pic of the 2010 branding featuring "Feel it in the Air" from the Humewood train bridge. The bus in the pic is one of the new buses that is used on the new Bus Rapid Transport system (BRT) routes and is ferrying soccer supporters from the Park and Ride at Kings Beach to the stadium. Click the link to see the "Feel it in the Air" advert on YouTube. For more picture that you need to look skywards for, visit Skywatch. 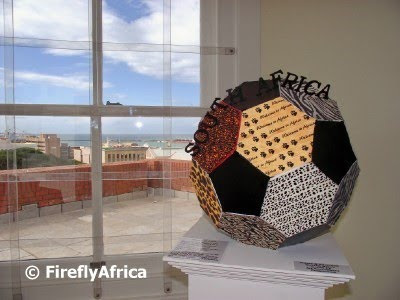 There is currently an exhibition called "For the love of the game" on the go in the newly revamped lighthouse keeper's cottage on the Donkin Reserve. 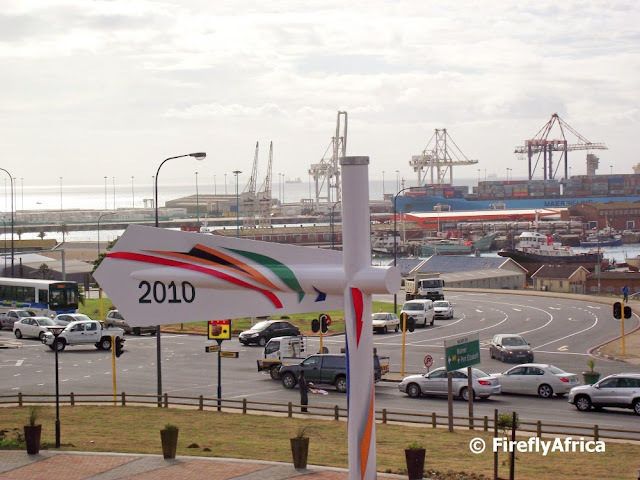 (I will do a series of posts on the "new look" Donkin Reserve after the World Cup). 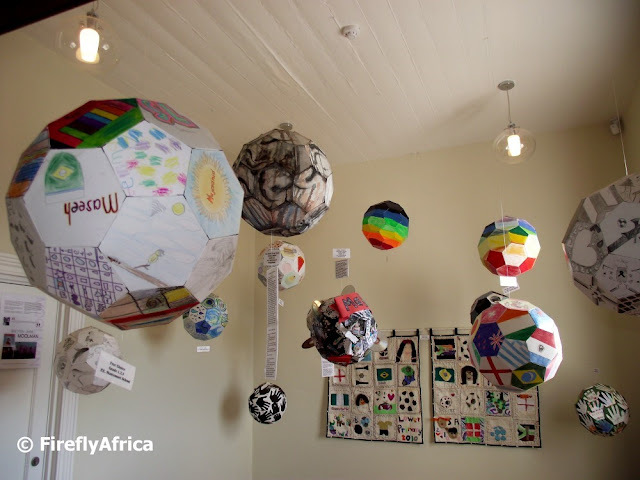 The exhibit consists of decorated paper soccer balls done by art students of the Art Enrichment Programme and the PE Montessori School. The kids were given the clean balls and were allowed to decorate them in any way they liked. While I was having a look around a group of Chilean supporters came through and eventually bought 6 clean balls to take back home to decorate. No, this isn't The Hoff sitting on his lifeguard chair on Baywatch. 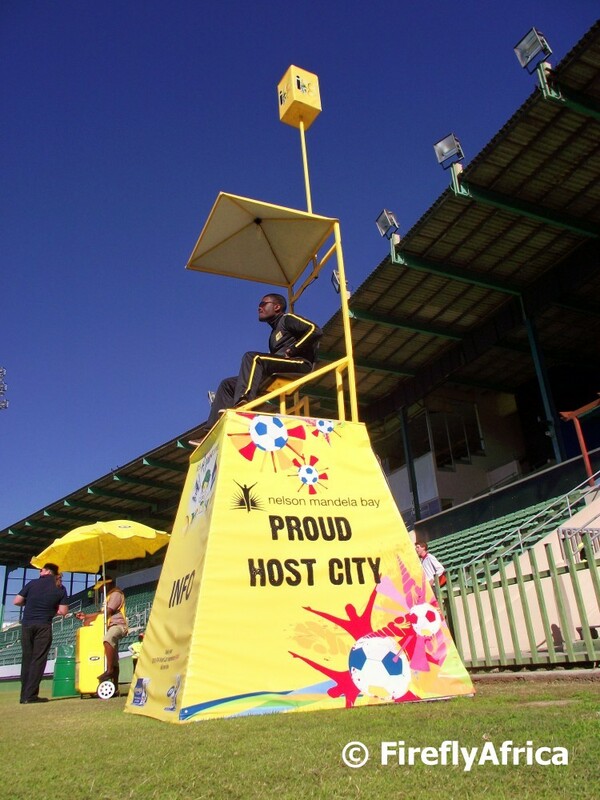 Anybody needing information about the 2010 FIFA World Cup, the Fan Fest programme, transport details or anything else on the event can go to the guys sitting on their high chairs around the Fan Fest. On those cold windy days I actually feel sorry for these guys as it's been quite chilly on some occations. 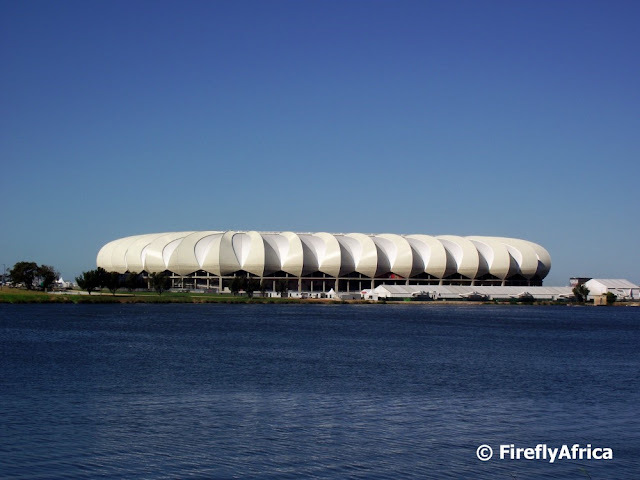 Today the Nelson Mandela Bay Stadium here in Port Elizabeth is hosting its 4th game of the 2010 FIFA World Cup between Chile and Switzerland. So far the stadium has already played host to Greece, Korea Republic, Portugal, Cote d'Ivoire (Ivory Coast), Germany and Serbia. The last first round match here will be England vs Slovenia on Wednesday. We are all still waiting with bated breaths to see who will play here during the knockout rounds. Since the start of the tournament I have posted a picture of the Stadium at night as well as one of the stadium roof. Today's pic is one of the whole stadium as seen from across the North End Lake. On the two traffic circles outside the airport two big (half) soccer ball shaped structures surrounded by flags have been put up. 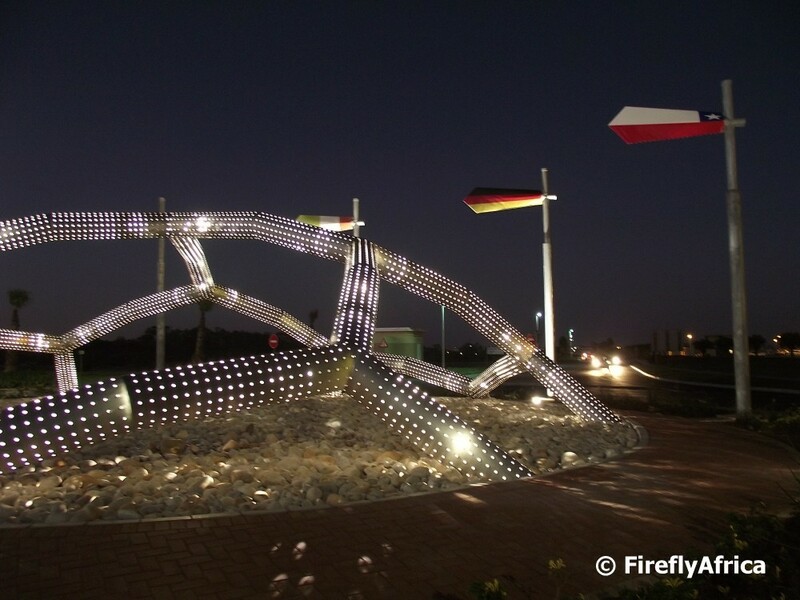 At night the structures are specially beautiful with lights shining through thousands of holes in the tubes. I have done a post about these structures on The Firefly Photo Files before, so please follow the link for more pictures. 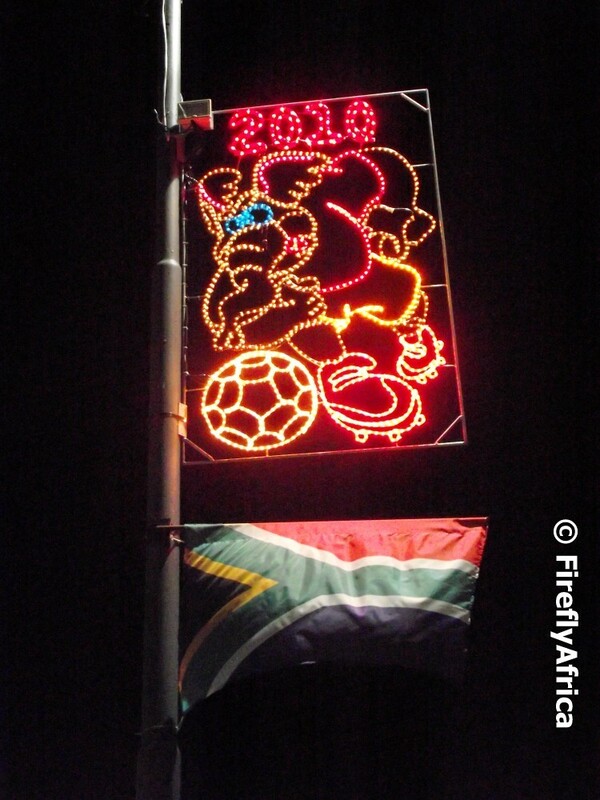 Outside the FIFA Fan Fest at St Georges, the municipality has put up festive lights for the occasion. The elephant refers to the fact that the Addo Elephant National Park is situated just outside Port Elizabeth and that provincial sports teams from the area use the elephant as their mascot. I worked a shift at the FIFA Fan Fest at St Georges Park last night and popped out to have a look at the entertainment on the stage between the matches on the big screen. On the stage was a local rap band strutting their stuff to the enjoyment of the crowd. 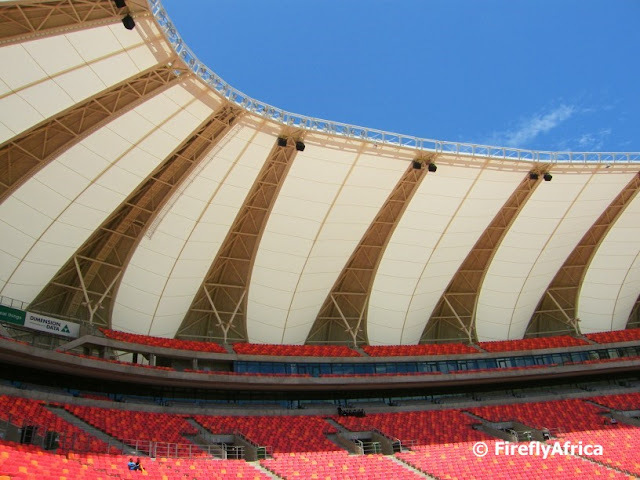 Looking up at the roof of the Nelson Mandela Bay Stadium in Port Elizabeth. The stadium's nickname is The Sunflower due to the petal like look of its roof structure. I know its a bit tongue in cheek, but if you look at it from the outside or above, it also looks a bit like a meringue. But that I say with all the respect in the world, as I am very very proud of our magnificent stadium. 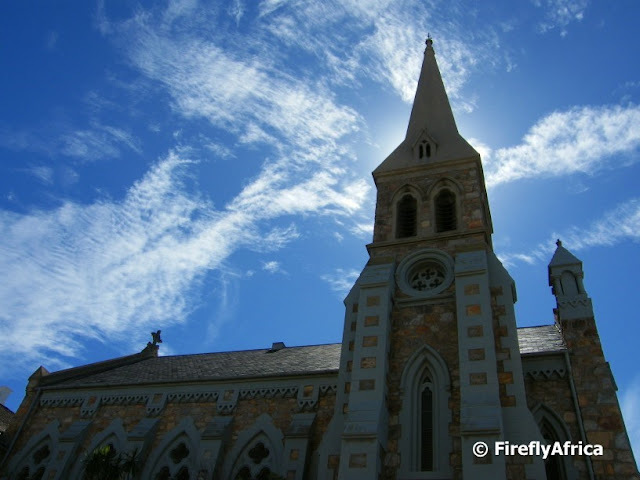 For more pictures looking skywards, visit the awesome people at Skywatch. 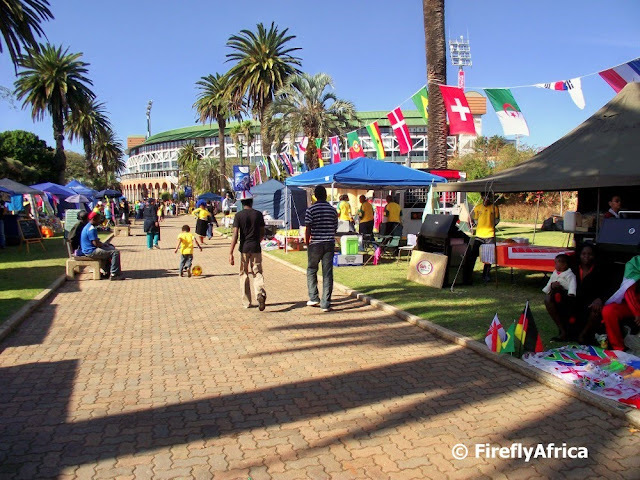 Outside the boundary of the St Georges FIFA Fan Fest but within St Georges Park, the municipality has registered and allowed quite a number of food and craft vendors to set up shop for the duration of the World Cup. For those inside the Fan Fest its a cheaper option to have lunch or dinner than to buy from the vendors with their regulated prices within. I feel a bit sorry for these vendors cause the last couple of days have been cold and wet and some of them had little or no shelter over their stalls when I walked past on the weekend. The official FIFA Fan Fest is situated at St Georges Park cricket ground. 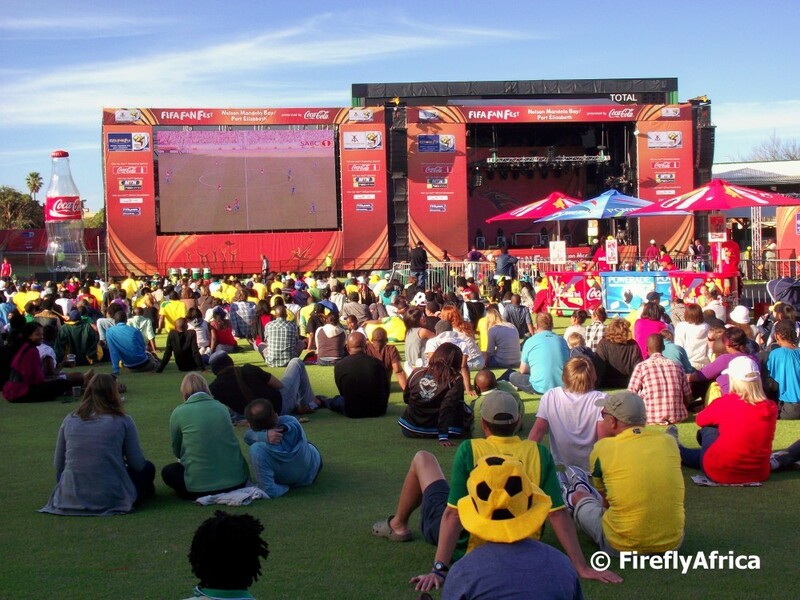 The main feature is the 45 square meter big screen (the biggest screen of all the FIFA Fan Fests in the country) that shows all the matches live. In between the matches there are entertainment on stage as well as other activities going on around the Fan Fest. Ed's note: My friend Rochelle who lives in Vancouver, Canada, has reminded me that the last time this particular screen was used was at the Winter Olympics in Vancouver earlier in the year. 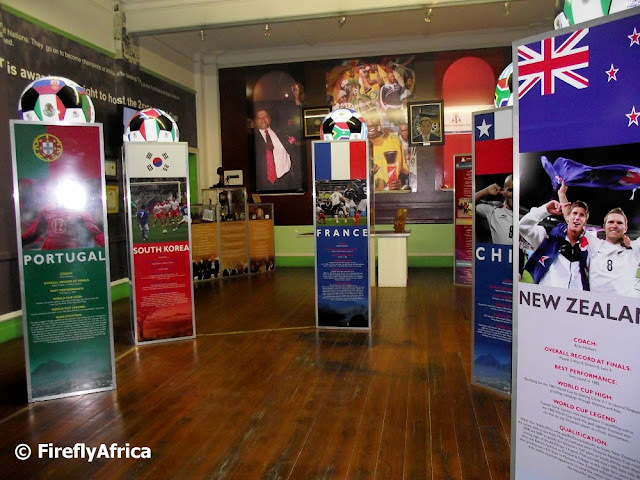 The South End Museum currently has a World Cup exhibit featuring quite a lot of information on PE local and CEO of the 2010 FIFA World Cup South Africa Local Organising Committee, Danny Jordaan. 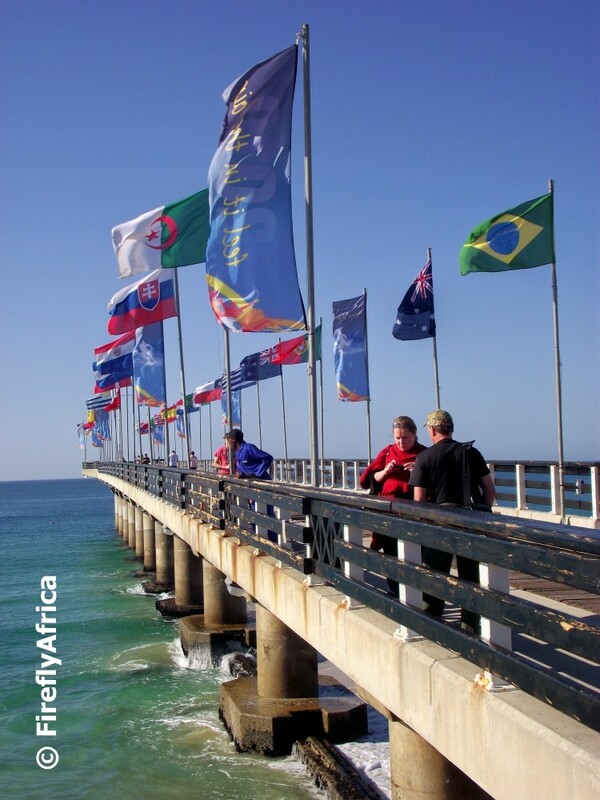 Shark Rock Pier at Hobie Beach is flying more than just the beach's Blue Flag, its also decked out in all the flags of the countries playing in the 2010 FIFA World Cup. Love them or hate them, the vuvuzela is become part of soccer in South Africa and the craze is slowly starting to spread across the world. The vuvuzela is a plastic blowing horn, approximately one metre in length, and commonly blown by fans at football matches in South Africa. It requires some lip and lung strength to blow and emit a loud monotone sound like a foghorn or an elephant. They are generally hated, but is growing on the South African population like a rash. In the past it was used mainly by black people with whites hating it with a passion. This is now changing. At the recent Super 14 semi finals in Soweto, staunch Blue Bull supporters who would have choked in their brandy and cokes 3 months ago if you had to tell them vuvuzelas would be allowed at those matches, were proudly seen sporting blue vuvuzelas and were given tips by the black supporters. Any way, this last Wednesday was declared Vuvuzela Wednesday. People were asked to blow their vuvuzelas for 5 minutes at noon. We all headed out to the curb and made our noise and waved our flags there. 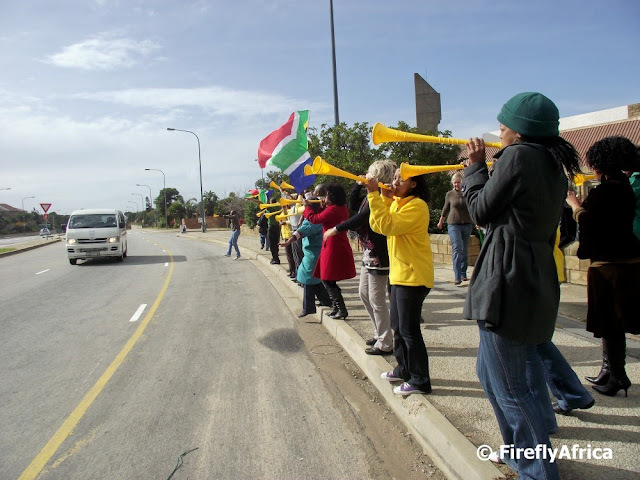 In Sandton in Johannesburg over 100 000 people came out to blow their vuvuzelas in support of Bafana Bafana who was on an open bus tour through the area. By the way, South Africa drew their opening game 1 all against Mexico last night. 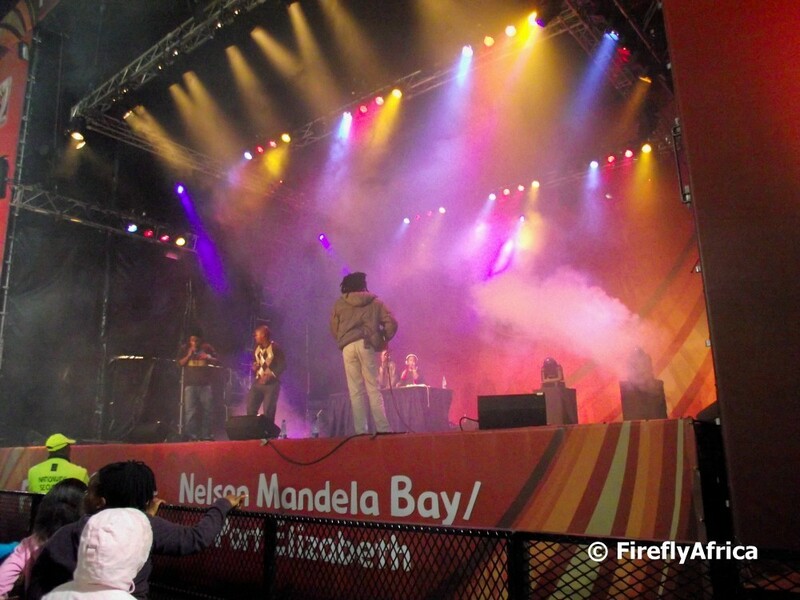 Today is the start of what must be the biggest event ever staged on the African continent. The 2010 FIFA World Cup opening game between Bafana Bafana (South Africa) and Mexico takes place in Johannesburg this afternoon (11 June 2010) while the first of 8 games in Port Elizabeth is tomorrow (Saturday 12 June 2010) between Greece and South Korea. 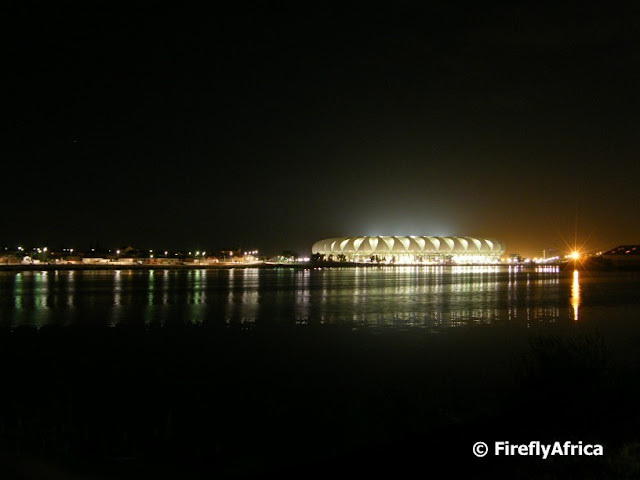 The games in Port Elizabeth take place at the magnificent new 48000 seater Nelson Mandela Bay Stadium next to the North End Lake. My favorite view of the stadium is across the lake at night when the lights are on. A couple of hundred meters down the Sacramento Trail from the Schoenmakerskop side you will find a monument marking the site where the Portuguese gallion Sacramento ran aground on 30 June 1647. 72 survivors set out to walk the 1350 km to the closest port which was in Mozambique. Of the original 72, only nine arrived in Delagoa Bay on 5 January 1648 and of the nine only four made it back to Portugal alive. The wreck site is also pointed out by one of the ships original brass canons which was salvaged from the site and points towards it from Schoenmakerskop. On Sunday afternoon I went on a photo walk with a couple of other photographers on the first section of the Sacramento Trail. The Sacramento Trail stretches along the coast between Schoenmakerskop and Sardinia Bay over a distance of 4 kilometers which means you would have covered 8 km walking it there and back. 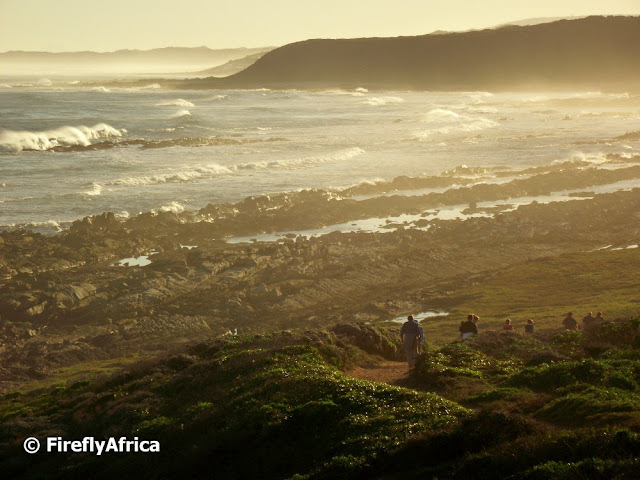 The trail has some awesome view points and follows a route that will take you right down onto the rocky coastline as well as through the coastal fynbos. 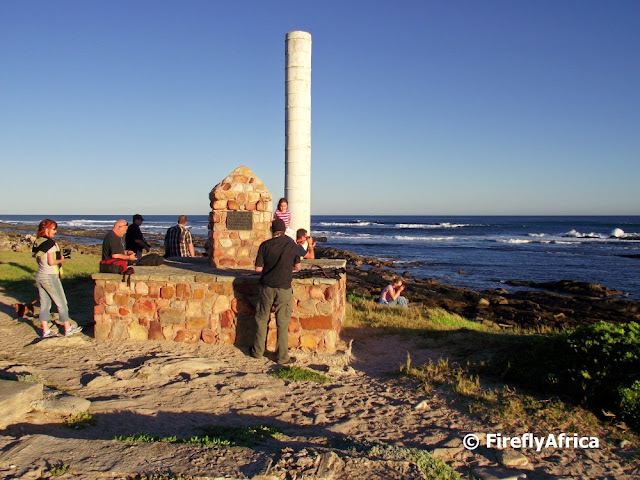 The Sacramento Trail is probably the most popular trail in Port Elizabeth and can easily be done in a morning. 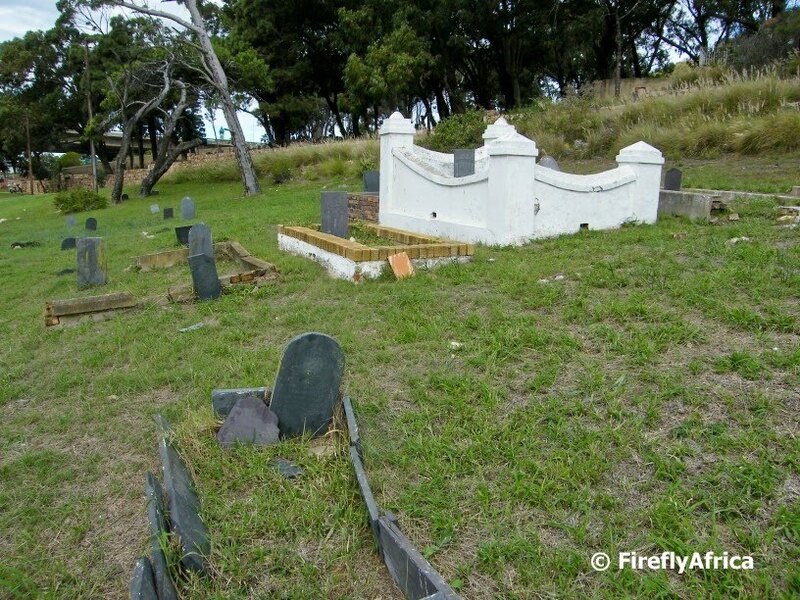 Driving down Brickmakers Kloof (and over the new bridge), the historic St Mary's Cemetery is situated on the right hand side across the road from the old bus sheds. Very few people notice that between the road and the St Mary's Cemetery there is a number of graves. They seem to be Muslim graves, so I popped into the South End Museum to see if they had more information. Unfortunately there doesn't seem to be a lot of info available on it though. The guide at the museum did say that it is also referred to as St Mary's and that its been around since the early South End days. If I do find out more, I will update this post. This must be one of my favorite photos. I was on a game drive at Pumba Game Reserve and sitting in the front seat next to the game ranger. 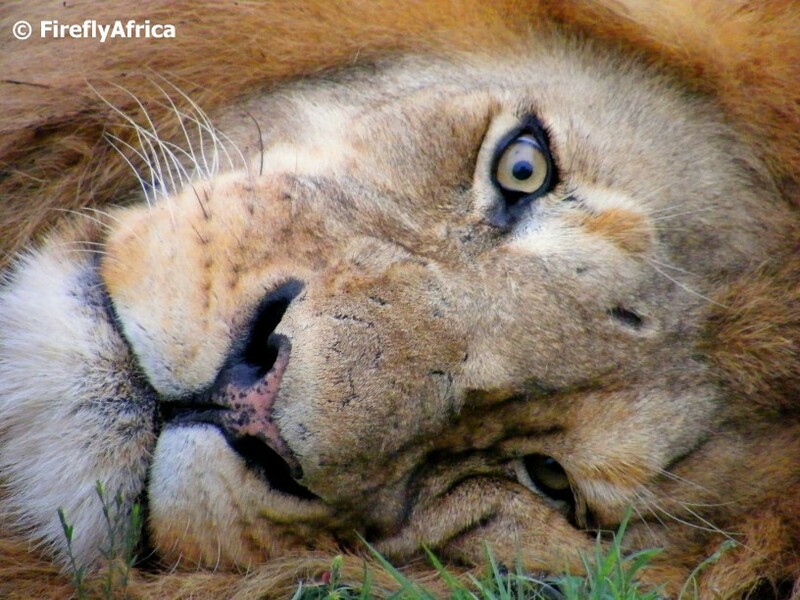 We found this male lion (seemingly) sleeping at sunset. We pulled up to him about 6 meters away and the ranger switched the engine off. As he did that the lion opened his one eye to let us know that he knows we were there. Sitting in the front seat meant that I was much lower than if I had been on the back seats and this allowed me to take this pic. I love visiting game reserves. 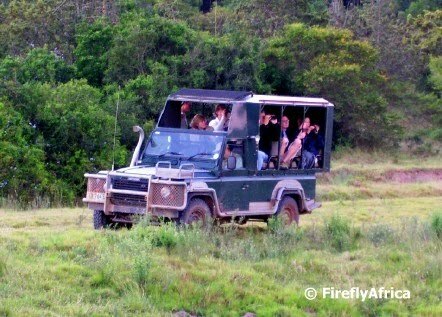 When I used to be a tourist guide and had to take guests to a game reserve, I always hoped that there would be space for me to go along on the open vehicle for the game drive. Most guides stay behind because they get to go so often that they get bored, but I never did. There is always something new or different to see and photograph. Now that I don't guide anymore my visits to game reserves are few and far apart, but when I do go I'm like a child looking forward to a party. 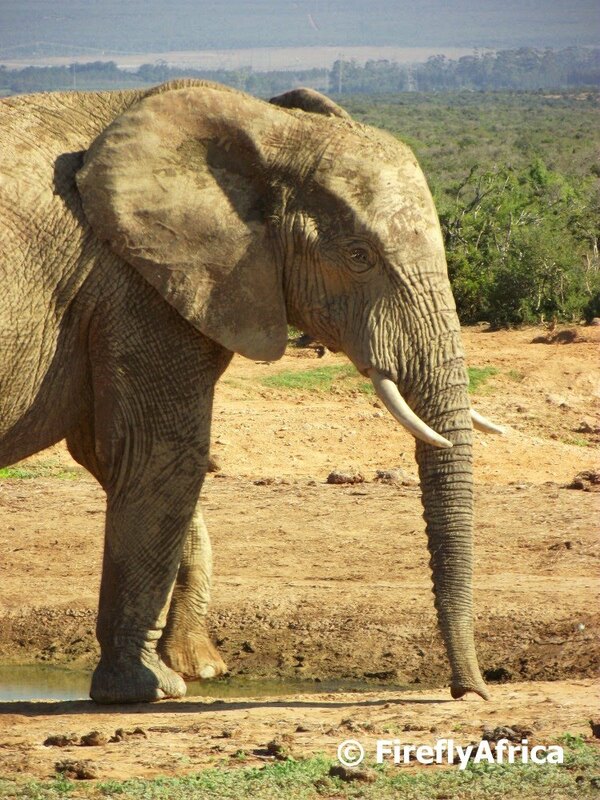 This picture was taken at Schotia Safaris Game Reserve. This view is looking down the beachfront from Pollok Beach towards the city centre in the background. 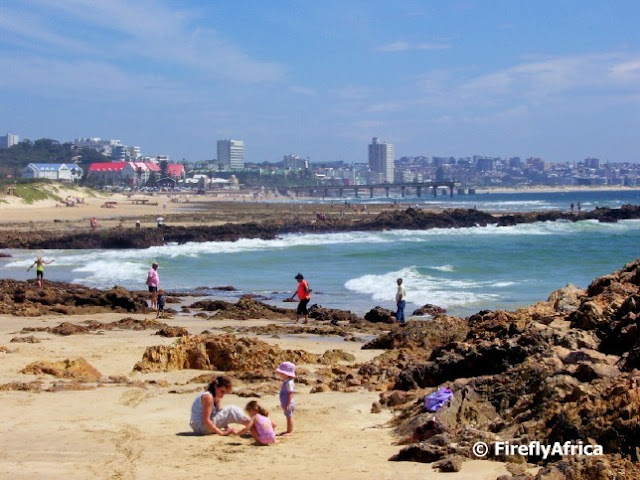 Shark Rock Pier at Hobie Beach is visible in the middle of the picture. 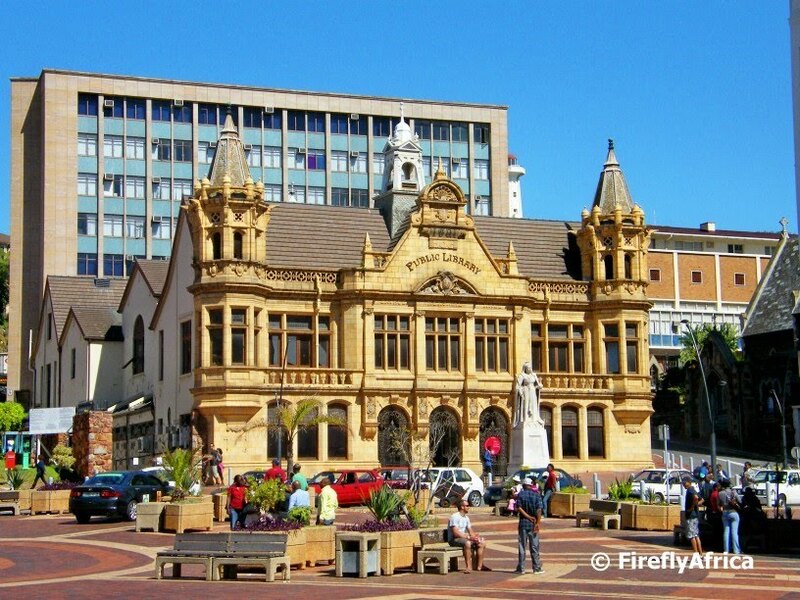 The magnificent Victorian Gothic style old Main Library building is situated next to Market Square in Port Elizabeth's city centre. Constructed in 1902, the building's terracotta facade was manufactured in England, shipped to Port Elizabeth in numbered blocks and rebuilt piece by piece on the present site. The statue of Queen Victoria standing in front of the library building is made of Sicilian marble and was erected and unveiled in 1903 to celebrate the queen's Diamond Jubilee which took place in 1897. Inside the library has a number of magnificent stained glass windows which is well worth seeing. 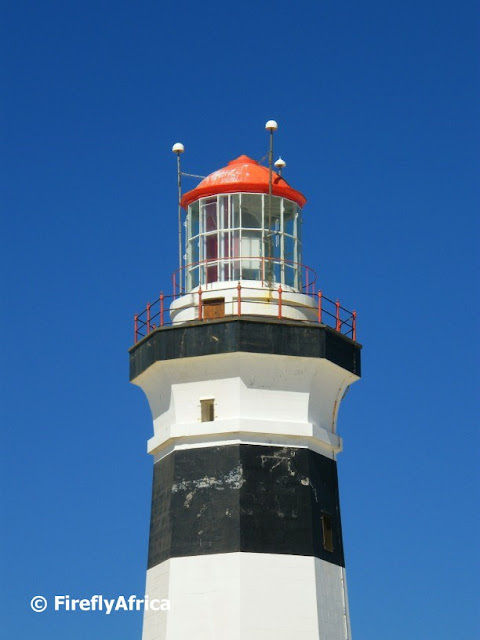 The Cape Recife Lighthouse was built in 1851 and guards the western point (Cape Recife) of Algoa Bay. One of the main reasons for the existence of the lighthouse is the dangerous Thunderbolt Reef. The lighthouse is a 24 meter high octagonal masonry tower and is painted with black and white bands. Each lighthouse on the South African coast are painted or built differently do differentiate them to ships. We visited the Addo Elephant National Park last Sunday for the first time in way too long. There was a time that I went there quite often, so it was very exciting to get back there. Addo had some rain a couple of weeks ago and the park seems to be slowly recovering from the devastating drought that is hanging over our area. We found this young bull at the Spekboom waterhole. At Spekboom you can actually get out of your car and take a walk through the bush in a fenced area before getting some excellent views of the waterhole on the other side.